Gangotri is one of the main religious places that hold prominent significance in the Chardham yatra concern. It is one of the important Dham in the pilgrimage circuit of Chardham. Located at an elevation of 3048 mts in Uttarkashi in Uttarakhand State, the shrine of Gangotri emits the pious aura of divinity and stands on the posture of one of the most pilgrimage centers among Hindus. Every year, thousands of devotes tuned into Chardham Yatra and pay homage to the temple of River Ganga named as Gangotri Temple. In the country, River Ganga is worshipped as the Goddess. People here believed that Gangotri is the place where Ganga takes the place after descended from Lord Shiva’s hair locks. The place offers a lively vision to the serenity and tranquility with the closet view of the snow clad mountains and the picturesque landscapes. the blissful aura of the Gangotri fill your mind with eternal peace and the beautiful attractions in the nearby areas such as Tapovan, Shivling peak and many others adds on the excitement and fun. The legendary history of Gangotri reveals some unbelievable yet important stories about the origin of the place. It begins with the arrival of River Ganga on Earth for the first time. The story entails the chapter that discloses the penance offered by King Bhagiratha to Lord Shiva for the salvation of his predecessors. As per the sources, his prayers were answered by Lord Shiva who then released River Ganga from his luscious locks and Ganga touched the feet of earth for the first time on this place. The River Ganga got the name of Bhagirathi after this incident. Another story covers the birth story of a beautiful woman Ganga who was born out of Lord Brahma’s water vessel (Kamandal). It was believed that When Lord Vishnu freed the universe by the curse of Demon Bali by playing the character of Vaman, Lord Brahma washed Lord Vishnu’s feet with water and collected it in his Kamandal. Another story claims the birth of Ganga in the form of human being. In the story, she married King Shantanu, the Pandava’s ancestor. During her married life, she throws back all her seven children into River Ganga. But when she is trying to throw her eighth child into the river, King Shantanu interrupted and she left him. The eighth child was Bheeshma, who played an important role in epic of Mahabhrat. On the right side of Bhagirathi River, here stands the Shrine of Gangotri, the Gangotri Temple. Located at an attitude of 3042mts, the temple was built by Amar Singh Thapa who was a Gorkha Commander. He built this temple in 18th Century. Bhojbasa: It is the beautiful place that offers captivating views of the Bhagirathi peaks. Situated at an altitude of 3775mts, it is the scenic spot landed on rugged terrains. 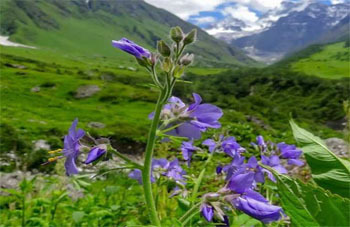 Harsil: An epitome of serenity and tranquility in the lap of Himalayas, Harsil is the most favored spot among the tourists and nature lovers. 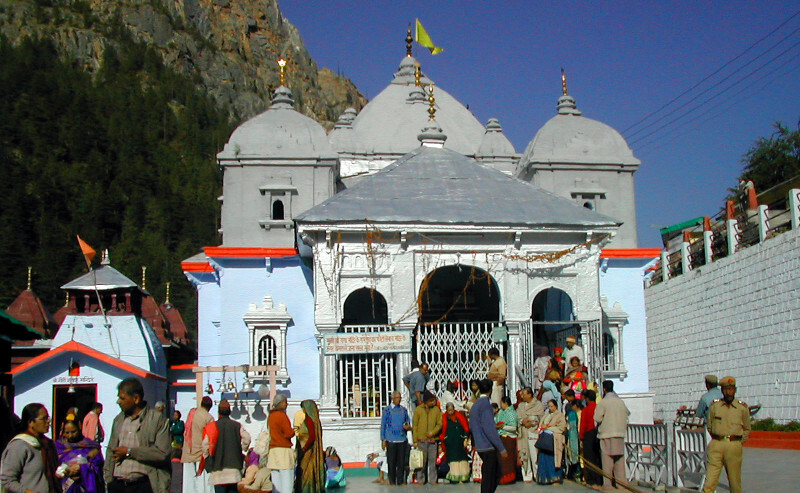 Gangotri temple: It is the prominent Hindu Temple located in the Uttarkashi district of Uttarakhand State. Its main attraction lies with a rock submerged and considered as the partial Shivalinga. Surya Kund: It is the revered site located near the Gangotri temple. Devotees visit this waterfall to pay respect to Sun God. Jalmagna Shivlinga: It is one of the magnificent sites that behold the supreme power of god. As per the sources, Lord Shiva sat on this place to lock Ganga in his hairs. You can view the Jalmagna Shivling in the winter season when the water level goes down. Gangnani: It is the place famous for its thermal water springs. Also, those looking for perfect place to attain peace of mind can find the best deal at this meditation center. Dharali: Dharali village is a picturesque location situated on the banks of River Ganges. It is famous for Rajma cultivation and its apple orchards. Bhaironghati: It is situated at a distance of 10km from Gangotri. Here located is the temple of Bhairav Nath. You can enjoy the thick forests around the temple. They are worth watching. Tapovan: It is a beautiful meadow that is located at an altitude of 4460mts above sea level. You can watch the beautiful flowers on this meadow and can also watch the surroundings peaks and ranges after climbing on this meadow. Gaumukh Glacier: The Gangotri Glacier moves along the Gangotri track from Chaukhamba and get merged into the Gaumukh Glacier. It is believed that the Ganga water is 100% pure away from any impurities. Vishwanath temple: It is one of the renowned temples in Uttrakashi that holds a detailed description in Kedar Khanda and Skanda Puran. The temple is dedicated to Lord Vishwanath. In this temple, the Shivling placed carries the size of 60cm length and 90 cm circumference. Trekking: The area surrounding the Gangotri Shrine is full of lush green hills that allow the adventure lovers to enjoy trekking. The areas like Gaumukh and Tapovan offers the tourists with the best places to enjoy for trekking. Pilgrimage: Gangotri is the one of the best pilgrimage place. Being the part of the Chardham Yatra, the region receives thousands of devotees every year. Shopping: Being Gangotri is a revered place; it beholds several shops that sells images of deities and other related materials. Also, shopping freaks can find a great deal of useful items such as shawls, woolens, handicrafts here. Gangotri experience a cool environment all throughout the year. The average maximum temperature ranges somewhere 10-15 degree Celsius; while the minimum temperature turned into zero many times. The chilled environment raises the necessity to carry warm and woolen clothes while on the go to Gangotri. Summer season: During the summer season (April to June); the town experiences a pleasant temperature with maximum temperature of around 25 degree Celsius. The nights are quite chilly but then also the environment is enjoyable and allows smooth trip. Monsoon season: Monsoon season starts from end of July and continues till August end. During the monsoon season, it’s hard to reach to the temple as the area is prone to face landslides. Visitors are strictly advised to avoid the trip to Gangotri during the Monsoon season. Winter season: The winter season starts from November and continues till April and the weather is extremely chilled with heavy snowfall. During this season, the Gangotri temple remains closed. However, the trekkers and mountaineers find the season most appropriating for the adventure trip. Gangotri lies in the Uttarkashi region of the Uttarakhand State. The best time to visit the holy Shrine of Gangotri is during the month of April, May, June, September, October and November. The temple of Gangotri remains open from April’s last week to November first week. By Air: Gangotri is situated at a distance of about 250kms from Dehradun that carries the nearest airport named with Jolly Grant Airport. From the airport, you can easily get the road transport via taxi or bus to reach to your destination. Also, you can hire chopper service to land at Gangotri. By Rail: At a distance of about 234kms from Gangotri, here is Rishikesh that holds the nearest railway station. From here, regular trains carry the journey connecting with the major cities and states of the country. Also, you can hire taxi or bus to reach Gangotri. By Road: You can easily enjoy a wide coverage of road transport to reach Gangotri from various parts of the Uttarakhand State. Buses and taxis are easily available for your convenience. Gangotri beholds the charm that you are looking for. It is just the perfect destination for a serene and pious environment. The snow clad mountains and the clear crystal water of the Ganga River makes you contended with the purity and picturesque beauty of the captivating place. It is a must to visit place once in a lifetime.